You’re ideating while executing. With funding in hand, you must deliver. Patience? Well, it’s nonexistent. If this sounds familiar, you’re likely one of many energetic companies vying to grab the best talent possible to deliver on your mission. How well your workforce executes will depend on the quality of your onboarding and employee development. By building an eLearning program on a Learning Management System (LMS), you’ll get newbies up to speed and free your team to focus on the heavy brain work. 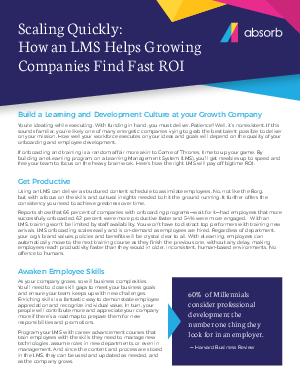 Here’s how the right LMS will pay off bigtime ROI.